Field Marshal Barclay de Tolly, whose merits before Russia are great indeed, is not deprived of his share of regard on the part of his descendants. It is no surprise that his monument was set up in front of Kazan Cathedral in St. Petersburg adjacent the Kutuzov monument. But among all of his merits there is one that is seldom discussed: just before the War of 1812, he established Russia’s military intelligence. Having acquired tremendous experience as both a combatant and general, Barclay de Tolly realized that information about the enemy’s plans should be obtained on a regular basis. Taking the post of defense secretary in 1810, he immediately began to organize of the Secret Corps in his department. It took him two years to complete this work and the intelligence service or Special Chancellery at the defense secretary formally appeared at the turn of 1812. The Chancellery’s activities were classified (they were not mentioned in the annual ministerial reports) and the responsibilities of agents were specified in a “special mandate.” The agency, which was almost never mentioned in the memoirs of contemporaries, directly reported to the defense ministry. The staff was not numerous: director, three expeditors and one translator. Barclay personally recruited the employees. He appointed aide-de-camp Colonel Alexei Voyeikov, a man he trusted, as intelligence director. Voyeikov began his military career as an orderly of Suvorov during the Swiss expedition of 1799. In March 1812, Voyeikov (a proxy of Mikhail Speransky, who had dropped out of favor) was replaced, contrary to Barclay’s will, by Colonel Arseny Zakrevsky, a combat officer with substantial battlefield experience. The Special Chancellery operated along three major lines: strategic intelligence (getting strategic information abroad), tactical reconnaissance (collection of data about the enemy’s troops deployed in neighboring states), and counter-espionage (uncovering and neutralizing of Napoleon’s agents). Both France and Russia had begun preparing for the war two years before it broke out. It was Barclay de Tolly, promoted to the post of defense secretary on January 18, 1810, who led strategic development in Saint Petersburg. He was well aware that without a network of agents that would provide the Russian commanders with information about the preparations and military-economic potential of the mighty adversary on a regular basis, no planning was possible. It was in January 1810 that he reported to the Emperor on the program of military intelligence organization and asked the permission to send officers to the Russian embassies, with a respective mission. Czar Alexander accepted that proposal and soon appointed military agents (akin to contemporary military attaches) in European capitals at the Russian embassies. Rather high demands were made of the candidates. All military agents served to the rank of general, except for Orlov who lost a leg in the Battle of Borodino at the age of 22, and retired as colonel. 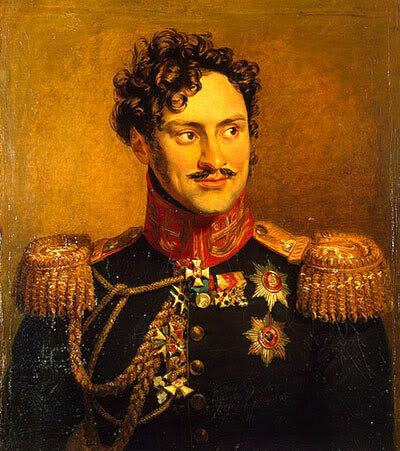 Chernyshev climbed to the very top of the bureaucratic ladder: in the reign of Nicholas I he helmed the military establishment and later became chairman of the Council of Ministers, the number two man in the empire. He transmitted most valuable information, since he was located in the very den of the enemy. 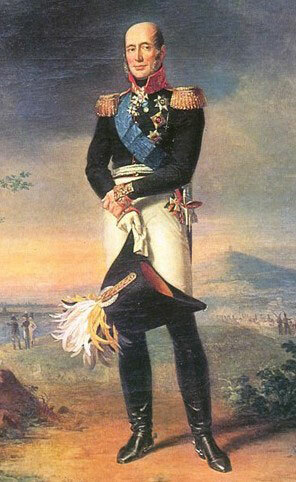 Chernyshev proved himself in the military-diplomatic arena as early as in 1809 during the French-Austrian campaign: Alexander I entrusted him with delivering the letters which the emperors were wrote to each other; because of this, contemporaries christened this outstanding officer of the guard as a “perpetual postman.” After being sent on a mission to Paris, Chernyshev quickly made extensive contacts among the French nobility. Napoleon himself was kind to the Russian officer – he invited him to keep his company in hunting and discussed with him the general political situation in Europe. The French Emperor understood perfectly well that Chernyshev would transmit all his words to Alexander and hoped to influence the Russian Emperor in this way. But Napoleon’s favor helped Chernyshov to widen the circle of contacts in Paris. Chernyshev became a highly revered figure of Napoleon’s entourage and an insider in the house of Napoleon’s sister, Caroline Bonaparte, Queen of Naples. Rumors had it that Chernyshev had an affair with Napoleon’s other sister, Pauline Princess of Borghese, who was a real beauty in her time. Alexander Chernyshev became a public hero following a ball in the palace of the Austrian Ambassador, Prince Schwarzenberg, during which he rescued a lot of people, including the wives of Marshals Ney and Duroc, after the palace caught fire. Chernyshev’s circle of contacts and his reputation as a bright heart-throb made people relax in his presence and enabled him to obtain information about what was going on in the royal court and about France’s preparations for the war. Even though he didn’t stay in Paris long, Alexander Chernyshev managed to build an extensive network of informers in all strata of the Paris society. The most valuable information was supplied by the one called Michel who served at the French Defense Department. Michel was recruited by Russian diplomat Pyotr Ubri back in 1804. In addition to highly classified documents, Michel had access to a detailed account of the numerical composition of the French armed forces. This report came out every 15 days compiled on the basis of regimental and battalion data. It was published in one copy for Napoleon’s use only. Like copies of many other documents, including French intelligence reports about the condition of the Russian army, a copy of this report, though somewhat belatedly, eventually made its way to St. Petersburg. As a result, the Russian military command was fully aware of France’s military preparations. The French counter-intelligence could not help but pay attention to Chernyshev. He was being followed and was regularly approached by false informers but without result. France’s Police Minister Savarie, who hated Chernyshev with all the fibers of his soul and looked for a chance to drive him out of Paris, organized a newspaper publication whose author hinted openly that Russian officer Chernyshev was a spy. As the clouds began gathering, Chernyshev made a slip which was unforgiveable for an intelligence agent. While getting ready for a trip to St. Petersburg with a letter from Napoleon, he burned all compromising evidence but overlooked a fairly important note that accidentally slid under the carpet. The police squad that raided his house upon his departure found the note and identified the handwriting as Michel’s. As a result, Michel was guillotined, and his henchman Sageais was sentenced to the pillory and a fine. Chernyshev had managed to escape arrest, having left the territory of France by then. His gaffe, however, did a lot of damage depriving the Russian command of a valuable source of information at a time when French forces were already marching towards Russia’s border. Chernyshev’s failure in Paris forced Russia to ramp up its intelligence network in German principalities. The informer network was run by Justas Gruner, ex-Minister of Police in Prussia, who resigned after the signing of the Franco-Prussian Union Treaty in 1812, left the country for Austria and maintained contacts with German patriots from there. Gruner used invisible ink to write his reports for Russia and he sent them via a specially organized communications point on the Austrian-Russian border. He continued to supply Barclay’s ministry with intelligence data right until August 1812, when he was arrested by the Austrian authorities on demand of France. Colonel Pyotr A. Chuikevich, a famous military writer who worked for the Special Chancellery, was responsible for processing the reports. In January 1812, he compiled a map of French divisions that registered the movements of Napoleon’s troops. The supplied data was crucial for assessing the numerical strength of the first echelon of Bonaparte’s Grande Armee. Napoleon’s first division was 400,000-500,000 strong. This report enabled the Russian Defense Department to devise the army strategy for the impending war. The majority of Russia’s top military commanders believed that direct clashes with the French had to be avoided. This is what military agents Chernyshev and Teil were recommending in their reports from abroad and the same suggestion was made by Chuikevich in his analytic note sent to Barclay on April 2, 1812: “The loss of several governorates should not frighten us, for integrity of the state depends on the integrity of its armies.” Chuikevich proposed to abide by the following strategy: “Evading general battles, waging a guerilla war using mobile formations, especially in the rear of the enemy’s operational line, preventing the forage, and resolute escalation of the warfare – these were new tactics for Napoleon, wearisome for the French and unbearable for their allies.” This was the tactic used by Barclay de Tolly and Mikhail Kutuzov, who succeeded him as Chief Commander. Tactical reconnaissance that scooped information on the contingent territories played an increasingly important role on the eve of the war. Reconnaissance was organized by special border residents, garrison commandants in the border towns, and the commanders of military corps. They all reported directly to the defense secretary on a regular basis. Starting in 1810 the commanders of the corps quartered in the border regions were ordered by Barclay to send agents to the neighboring states. This role was often played by local residents who did not have a knack for military art, but could be good scouts. Several months before the offensive of the French, tactical reconnaissance switched into high gear. As witnessed by General Leontiy Bennigsen, the Russian command in Vilno received almost daily “news and reports about the movements of the enemy’s corps.” Based on that information, Barclay concluded that Napoleon would deal a major blow from Eastern Prussia. He also ascertained the date when the Grand Armee was planning to cross the border. He was only uncertain about the place; yet he reached the main end of bringing the Russian Army into a full alert. Reconnaissance obtained valuable information from its numerous agents about the smuggling of Napoleon’s spies in Russia. The Russian prewar documents mention 98 persons sought on suspicion of espionage. Prior to and in the course of the campaign 30 agents of the enemy were detained. In wartime they were normally shot on the spot. The figure of retired cavalry captain, Prussian nobleman David Savant is worthy of special mention. He lived in Warsaw and, having lost his position and subsistence after formation of the Grand Duchy of Warsaw, a French satellite, he was forced to agree to work for the Polish intelligence. Yet upon his arrival in Russia he informed the authorities about his mission and began collaborating with Russians. In spring of 1812 the French again planted him in Lithuania which then belonged to Russia. With his aid Russian counterspies succeeded in partial neutralization of the enemy’s espionage ring. Savant regularly sent to his French bosses messages drawn in the Russian headquarters. When Napoleon’s envoy, the Count of Narbonne, arrived in Vilno to meet with Alexander I in May 1812, Savant handed over to him a report prepared at the Russian headquarters. The message was that Barclay intended to fight a general battle against the French right at the border. Proceeding from this information, Napoleon built a plan of his campaign. Having encountered no resistance after crossing the Neman river, he was greatly disappointed. The Higher Military Police that assumed the counterespionage functions was formed in early 1812 by a clandestine decree of Alexander I. Its representatives were active at each of three armies operational at the beginning of the war, reporting to their chiefs of staff. The military police was spearheaded by a descendant of French natives, Yakov I. de Sanglain. Ten of his employees recruited from among the civil officials and retired officers were engaged in daily operations. Shortly before the war the people of de Sanglain were busy uncovering Napoleon’s agents in the western border governorates; with the beginning of combatant actions their key mission was obtaining information about the enemy’s movements. Well-placed groups of local patriots were created in the cities of Velizh, Polotsk and Mogilev when occupied by the French. They were constantly in touch with the officials from the Higher Military Police and sent to the flanks and into the rear of Napoleon’s Army. A special group was seizing the enemy’s officers and soldiers. When the offensive commenced, the subjects of de Sanglen were also commissioned to look for individuals who stained themselves by their collaboration with the adversary. The Higher Military Police did not attain to astounding success, which can be explained by its inexperience and by the fact that it was understaffed. Nevertheless it brought positive results, especially during the campaigns of 1813-1814 abroad. The department had existed only three years before being reorganized. Prompt information about the enemy was scooped by military scouts who did not have a real organizational structure. Cavalry was the eyes and ears of the army more than anything else. Here Russians had an apparent competitive edge – the Cossack regiments which were in fact the only truly light cavalry in both armies (Cossacks did not have any wagon trains). 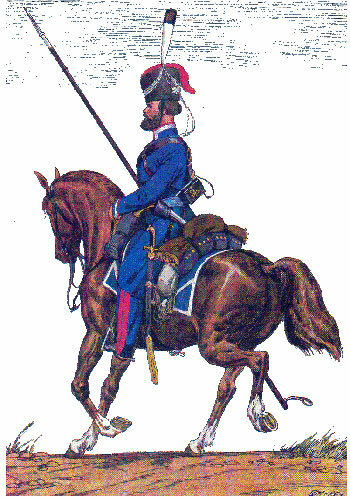 The French cavalry, which was almost twice as numerous as the Russian one, quickly deteriorated due to forage problems and the challenging conditions of the expedition. It was increasingly difficult for the French to counter the scouting raids of Cossacks. In the second period of the war (with the arrival of militia equestrian regiments, especially the Don ones) the Cossack cavalry dominated the theatre of war, regularly delivering captives and reconnaissance information to the command. Local population also did their best to provide the Army with valuable information. “The locals encouraged by incessantly arriving squads served as the most loyal guides, providing them with detailed information, and lastly took the arms and joined the guerillas in large numbers,” reported a Russian commander. Under the conditions of guerilla warfare the French were utterly incapable of conducting reconnaissance. Russian military intelligence celebrates its bicentenary this year. It’s hard to imagine that such an important service once consisted of several dozens of officers. Meanwhile during the thick of war against Napoleon that group did more than could be expected from a hastily recruited group of people who did not have any special skills. The main thing was their worked produced convincing evidence that military intelligence ought to operate within a single integrated structure.